Family whose members are widely spread throughout Germany, Denmark, Sweden, England, and America. There is a tradition that the family was originally settled at Bologna, but emigrated to the Westphalian town of Warburg, whence it removed to Altona, near Hamburg. The earliest known bearer of the name is Levi Joseph Warburg, whose son Jacob Samuel died in 1667 at Altona. 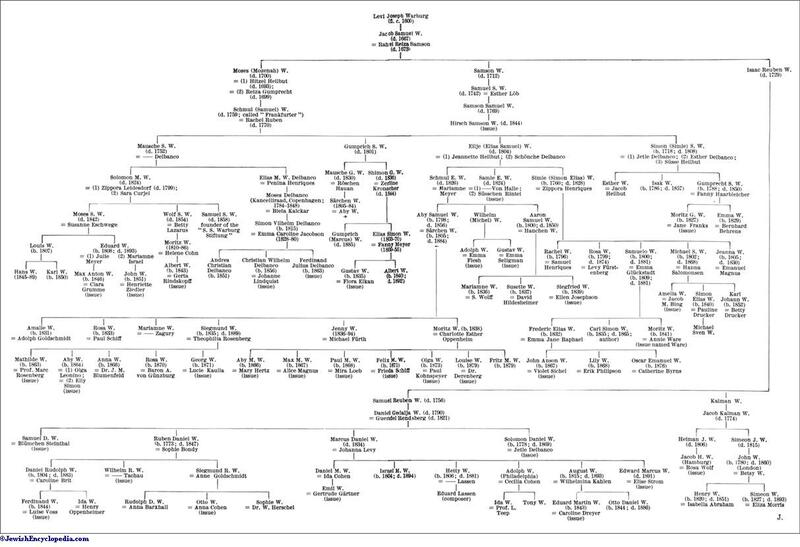 From him are descended two branches, one through Samuel Moses Warburg (died 1759), known also as "Frankfurter," and the other through Samuel Reuben Warburg (died 1756), whose grandson R. D. Warburg (1778-1847) founded the firm of Warburg in Hamburg. Samuel Moses Warburg had four sons: from the eldest, Moses (died 1752), are descended the present branch at Altona and the Copenhagen family of Delbanco, which adopted that surname. 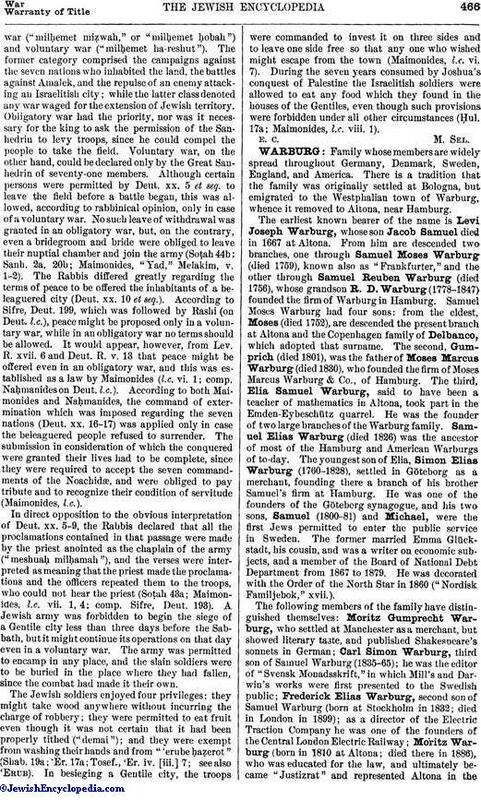 The second, Gumprich (died 1801), was the father of Moses Marcus Warburg (died 1830), who founded the firm of Moses Marcus Warburg & Co., of Hamburg. The third, Elia Samuel Warburg, said to have been a teacher of mathematics in Altona, took part in the Emden-Eybeschütz quarrel. He was the founder of two large branches of the Warburg family. 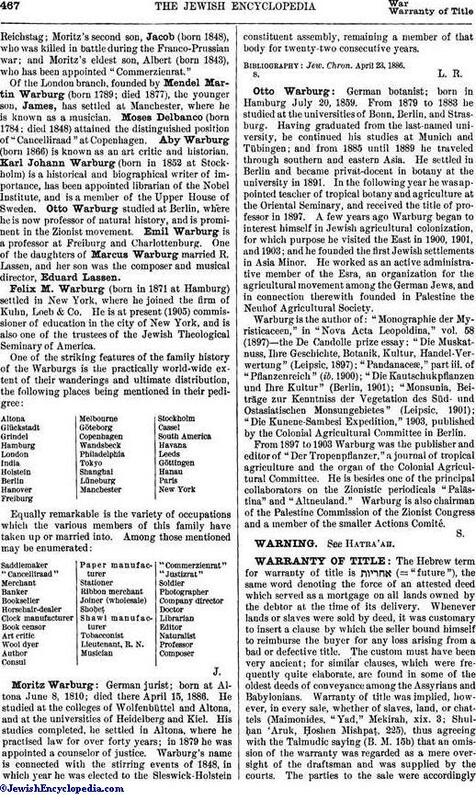 Samuel Elias Warburg (died 1826) was the ancestor of most of the Hamburg and American Warburgs. of to-day. The youngest son of Elia, Simon Elias Warburg (1760-1828), settled in Göteborg as a merchant, founding there a branch of his brother Samuel's firm at Hamburg. He was one of the founders of the Göteborg synagogue, and his two sons, Samuel (1800-81) and Michael, were the first Jews permitted to enter the public service in Sweden. The former married Emma Glückstadt, his cousin, and was a writer on economic subjects, and a member of the Board of National Debt Department from 1867 to 1879. He was decorated with the Order of the North Star in 1860 ("Nordisk Familjebok," xvii.). The following members of the family have distinguished themselves: Moritz Gumprecht Warburg, who settled at Manchester as a merchant, but showed literary taste, and published Shakespeare's sonnets in German; Carl Simon Warburg, third son of Samuel Warburg (1835-65); he was the editor of "Svensk Monadsskrift," in which Mill's and Darwin's works were first presented to the Swedish public; Frederick Elias Warburg, second son of Samuel Warburg (born at Stockholm in 1832; died in London in 1899); as a director of the Electric Traction Company he was one of the founders of the Central London Electric Railway; Moritz Warburg (born in 1810 at Altona; died there in 1886), who was educated for the law, and ultimately became "Justizrat" and represented Altona in the Reichstag; Moritz's second son, Jacob (born 1848), who was killed in battle during the Franco-Prussian war; and Moritz's eldest son, Albert (born 1843), who has been appointed "Commerzienrat." Of the London branch, founded by Mendel Martin Warburg (born 1789; died 1877), the younger son, James, has settled at Manchester, where he is known as a musician. Moses Delbanco (born 1784; died 1848) attained the distinguished position of "Cancelliraad" at Copenhagen. Aby Warburg (born 1866) is known as an art critic and historian. Karl Johann Warburg (born in 1852 at Stockholm) is a historical and biographical writer of importance, has been appointed librarian of the Nobel Institute, and is a member of the Upper House of Sweden. Otto Warburg studied at Berlin, where he is now professor of natural history, and is prominent in the Zionist movement. Emil Warburg is a professor at Freiburg and Charlottenburg. One of the daughters of Marcus Warburg married R. Lassen, and her son was the composer and musical director, Eduard Lassen. Felix M. Warburg (born in 1871 at Hamburg) settled in New York, where he joined the firm of Kuhn, Loeb & Co. He is at present (1905) commissioner of education in the city of New York, and is also one of the trustees of the Jewish Theological Seminary of America. German jurist; born at Altona June 8, 1810; died there April 15, 1886. He studied at the colleges of Wolfenbüttel and Altona, and at the universities of Heidelberg and Kiel. His studies completed, he settled in Altona, where he practised law for over forty years; in 1879 he was appointed a counselor of justice. Warburg's name is connected with the stirring events of 1848, in which year he was elected to the Sleswick-Holstein constituent assembly, remaining a member of that body for twenty-two consecutive years. Jew. Chron. April 23, 1886. German botanist; born in Hamburg July 20, 1859. From 1879 to 1883 he studied at the universities of Bonn, Berlin, and Strasburg. Having graduated from the last-named university, he continued his studies at Munich and Tübingen; and from 1885 until 1889 he traveled through southern and eastern Asia. He settled in Berlin and became privat-docent in botany at the university in 1891. In the following year he was appointed teacher of tropical botany and agriculture at the Oriental Seminary, and received the title of professor in 1897. A few years ago Warburg began to interest himself in Jewish agricultural colonization, for which purpose he visited the East in 1900, 1901, and 1903; and he founded the first Jewish settlements in Asia Minor. He worked as an active administrative member of the Esra, an organization for the agricultural movement among the German Jews, and in connection therewith founded in Palestine the Neuhof Agricultural Society. Warburg is the author of: "Monographie der Myristicaceen," in "Nova Acta Leopoldina," vol. 58 (1897)—the De Candolle prize essay; "Die Muskatnuss, Ihre Geschichte, Botanik, Kultur, Handel-Verwertung" (Leipsic, 1897); "Pandanaceæ," part iii. of "Pflanzenreich" (ib. 1900); "Die Kautschukpflanzen und Ihre Kultur" (Berlin, 1901); "Monsunia, Beiträge zur Kenntniss der Vegetation des Süd- und Ostasiatischen Monsungebietes" (Leipsic, 1901); "Die Kunene-Sambesi Expedition," 1903, published by the Colonial Agricultural Committee in Berlin. From 1897 to 1903 Warburg was the publisher and editor of "Der Tropenpflanzer," a journal of tropical agriculture and the organ of the Colonial Agricultural Committee. He is besides one of the principal collaborators on the Zionistic periodicals "Palästina" and "Altneuland." Warburg is also chairman of the Palestine Commission of the Zionist Congress and a member of the smaller Actions Comité.